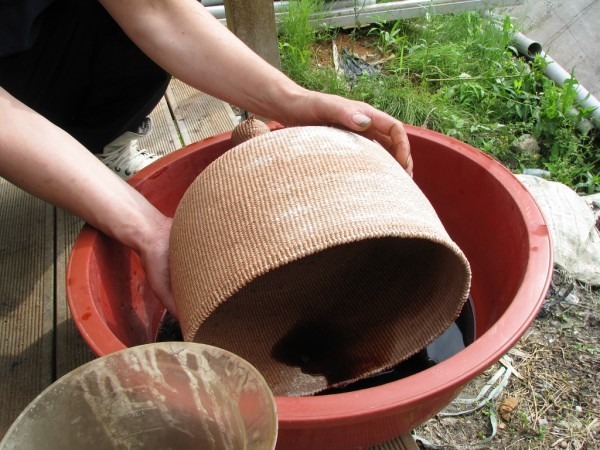 I traveled to Korea in 2008 on a Fulbright research grant to study the ancient sheet formation technique used to make hanji, Korean handmade paper. During my tutelage under the papermaker Jang Seong-woo, in Gapyeong, northeast of Seoul, I came to appreciate hanji’s long history and versatility, from its importance in textile and fiber arts to its central place in daily life. But my studies didn’t end there. Jang also taught me how to cord strips of hanji and weave them into gourd-like pendants, a process that forms the backbone of another Korean craft, jiseung (paper weaving). One frigid day in January 2009, Jang and I were discussing jiseung at his paper mill, while cooking dak (paper mulberry) over a wood fire, when we stumbled on an unexpected connection. He told me that his own jiseung teacher lost his two children and sister-in-law, and nearly lost his wife, in a car accident. The tragic story was eerily familiar. Six months earlier, I’d gone to Seoul in search of a man who made hanji dolls, only to find out that he had shut down his shop after his children were killed in an accident. Connecting the dots, we realized that we were talking about the same man, Na Seo-hwan. Jang insisted on introducing us. When I first went to visit Na in February 2009, I expected to meet an elderly man since I knew via Jang that Na had undergone heart surgery. Instead, Na was a jovial forty-something with long locks of curly grey hair, sporting a stylish black sweater and dark slacks. His home was neat, clean, and full of woven paper pieces. Tall glass jars of plants, insects, mushrooms, herbs, and bark, all steeped in brown liquid, lined the walls. Later, I learned that when his wife, Bong Hyo-soo, was struggling through more than twenty surgeries after the accident, he spent his days venturing into Korea’s mountains, seeking natural remedies to help her recover. He became obsessed, and brought back all sorts of treasures to preserve in alcohol. For a few years, he had even stopped weaving. Na is a third-generation jiseung master, who has played with hanji since his childhood. In time, he gained recognition for his work. He has held exhibitions, taught group and private lessons, appeared on television, and received an invitation to teach in Japan. But soon after he declined that invitation, the tragic accident changed the course of his life. Bong Hyo-soo, who miraculously survived the crash, never missed my weekly lessons with Na at their home. Without fail, she prepared refreshments and delicious meals to sustain us through the lengthy lessons—never less than four or five hours each. Na has had many students, but resists taking on new ones because they who inevitably balk at the sheer amount and tedium of the work involved. Like a master of any traditional craft, he is frustrated by students who do not want to learn jiseung the ddokbaro, or “straight,” way. (Other translations of ddokbaro—often used when referring to learning and living properly—include “correct,” “upright,” and “clear “). 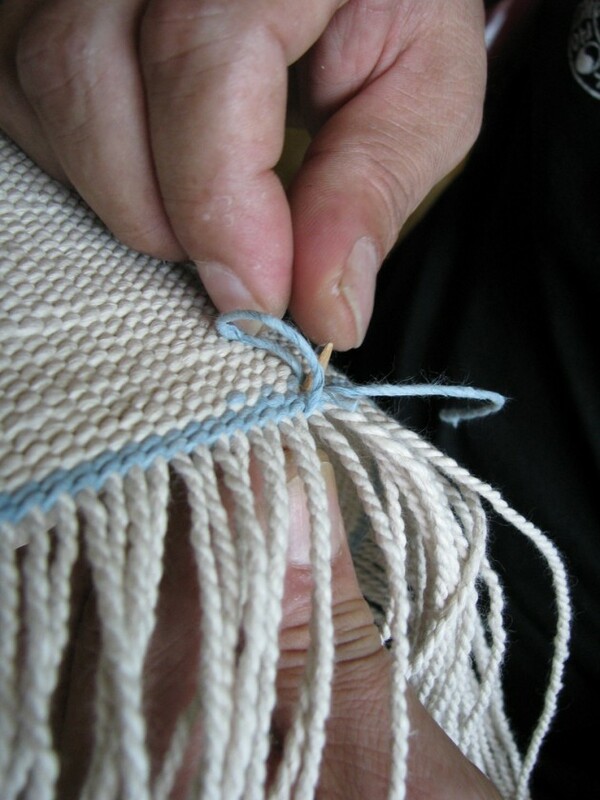 Traditionally, cording hanji was done by twisting single strips between the index finger and thumb, and later wound in pairs to make cords. These cords were weak, since the first set of strips had no anchor. But Na developed a unique method by anchoring not one but two strips of paper between his crossed legs to twist and wind between his hands. This sped up the process and created tighter, stronger cords since they were anchored and twisted within the broader space of the palms of his hands, rather than the pads of his fingers. Jiseung lessons are like a full body workout that strains the fingers, hands, wrists, neck, back, and legs. Beginners tend to cut corners whenever possible, but these variations can easily compromise the integrity of the final piece. When I brought my slowly growing pieces to him each week, Na could show me exactly where I had loosened my tension or taken a short cut. But Na is a father at heart. Despite his insistence on quality, he reminded me to take breaks to avoid fatigue. Taking a pair of paper strips, he deftly spun them in his hands so that each strip twisted counterclockwise, with one strip wound clockwise around the other. He repeated this action until half of each strip was corded, and then turned the cord around to complete the remaining length. The motion was brisk. I only saw a flurry of twisting paper and heard a crisp rattle. For my first piece, Na told me to go home and make two hundred cords, then unwind one hundred of them, all in time for my next lesson. When I returned with my bundles a week later, he bemoaned my inadequate cords but sighed and said we would begin, even though the cords’ quality defines the strength of the final object. We started by folding a knot of four noodle-like cords in half, and then twined the unwound cords around the spokes that formed the base of the piece. Na maintained such high tension while twining that the cords squeaked between his fingers, which started bleeding during our first lesson. While this alarmed me, I was lucky to emerge with only blisters and calluses. For months, I was at a loss about how to weave so tightly. Then, one day he pressed my thumb down with such force, I felt like a door had smashed it. Only then did I grasp his secret, whereupon my weaving tightened. Na taught me how to increase and decrease spokes to control the shape of an object, expose them to create open patterns, work with colored cords, change direction to create a double-walled vessel, and complete projects with several kinds of final rim finishes. Although I expected each step to be somewhat easier than the previous one, the end of a project was usually the hardest. This increased my appreciation for the craft. 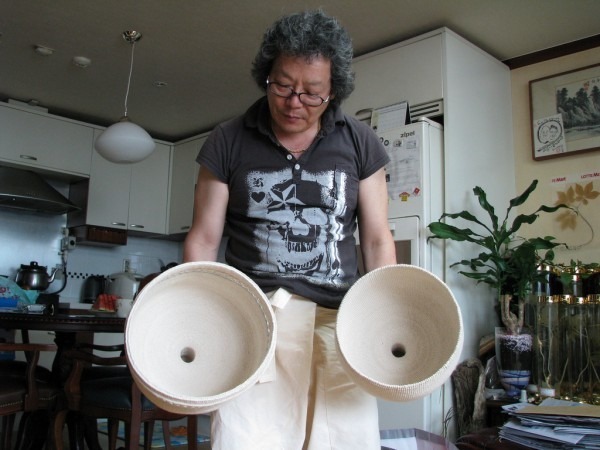 Koreans have made objects with jiseung techniques for hundreds of years. In a prime example of Korean frugality, Na told me that the edges trimmed from books at the end of the printing and binding process were always saved to make more precious hanji. 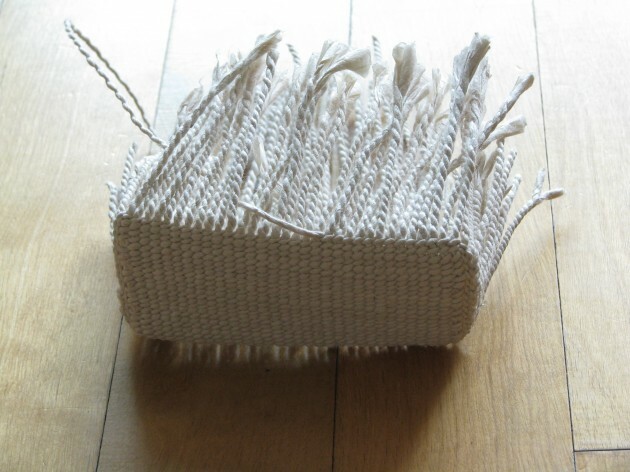 At some point, someone started playing with these long, narrow strips, and applied Korean basketry techniques to weave into being a variety of useful objects. 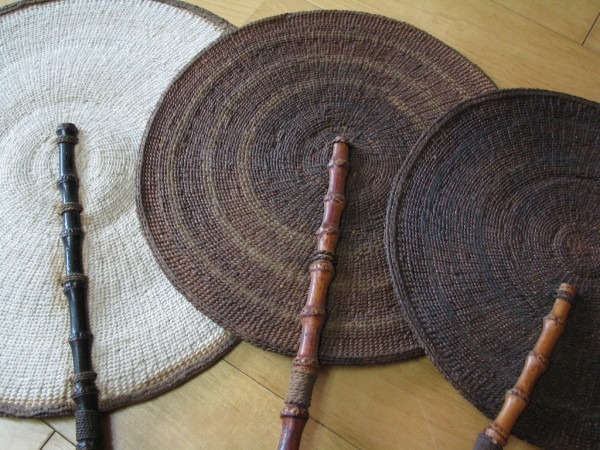 Though many pieces have been lost to theft, war, colonization, and modernization, extant woven hanji artifacts include shoes, quivers, brush holders, baskets, vessels, bags, purses, and lanterns. Another traditional jiseung object is the chamber pot, an unlikely application of paper used by brides. In the past, when a woman married, she made the often day-long physical journey from her natal family to her husband’s family, being carried along with her belongings in a covered palanquin by four men. Confucian culture forbade these men from seeing the bride, so she remained sealed inside the palanquin for the entire trip. Since it would have been indiscreet if they heard her bodily functions, a paper chamber pot made the most sense. It was light, did not make noise like a ceramic or metal container, and was beautiful—this last detail making it appropriate for a woman’s use. For waterproofing, chamber pots were finished in lacquer; other traditional finishes for jiseung objects include fermented persimmon juice and oil from the perilla plant, an Asian variety of the mint family (known as shiso in Japan). As he got to know me, he would insist that I weave gifts for my family in the U.S., and helped me make a set of teacups for my parents and sister. When an American friend visited me in Seoul, I brought her to a lesson and he gave her a beautiful bracelet that he had designed. When I complained of heat rash, he poured liquor from one of his tall glass jars into a water bottle that had belonged to his late daughter, and insisted I take it home and apply its contents to my skin. Though he and his wife* were not quite old enough to be my parents, I knew that I was more than just a student. I encouraged Na to exhibit his work so that a wider audience could see the treasures that thronged his home. Soon after I left Korea, he held a solo exhibit in a Seoul gallery, and not long after, won a top prize for his work in a second show. He recently told me that he has been meeting with publishers to write a book about jiseung. *After writing this article, I received the very sad news that Bong Hyo-soo passed away in the fall of 2010.